DUBBED “CHINA'S VENICE,” the 1,200-year-old water town of Wuzhen abuts the Grand Canal, Earth’s largest manmade waterway. 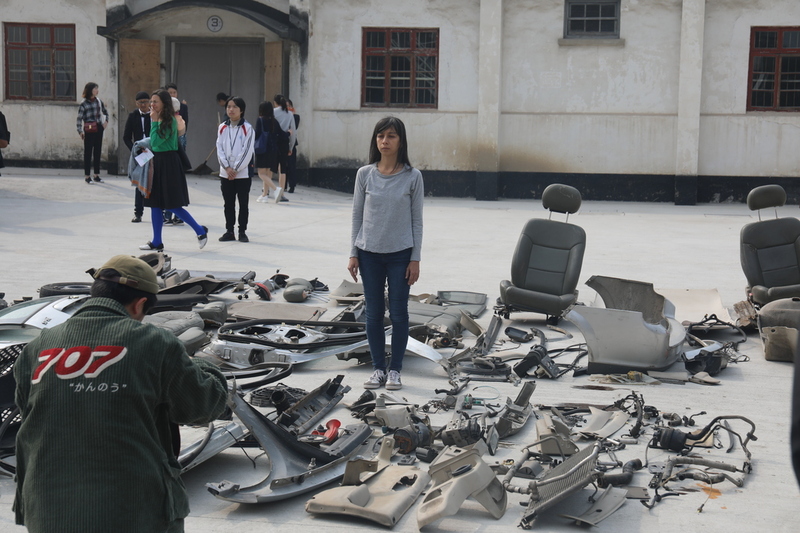 Twas the eve of Art Wuzhen, the second installment of a government-sponsored invitational exhibition, yet nestled inside the Mu Xin Art Museum, all appeared calm. Artist Chen Danqing sat in his executive director’s office, which hovers over the outside water as if buoyed by the surrounding bamboo. Having returned to his ancestral home of Wuzhen after decades of exile in New York, Mu Xin passed in 2011, but his creative spirit continues to shape cultural activities there today. This is reflected in subtly subversive messages, unobtrusive aesthetics, and vaguely traditional forms of craft. No artists currently live in Wuzhen––no one does, not since the town’s became a tourist destination. 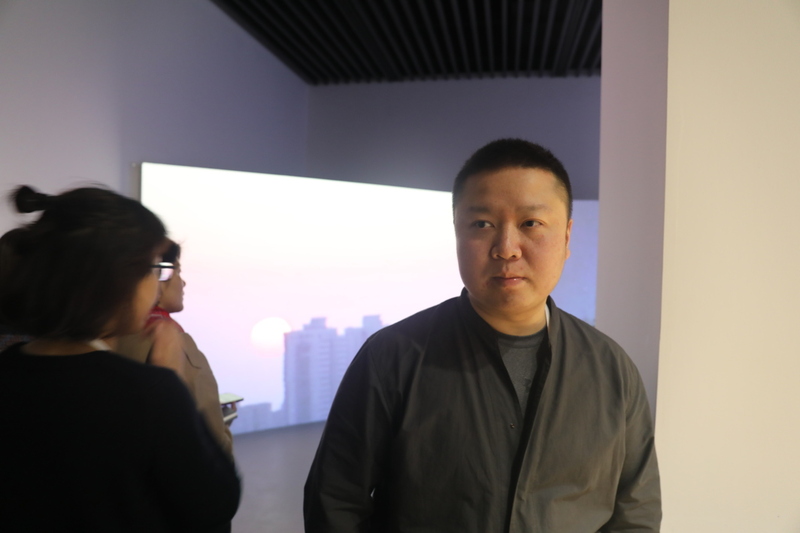 The man behind Wuzhen and the entire exhibition is the young official, Wuzhen native, and Mu Xin superfan Chen Xianghong. Chen Danqing has been his cultural advisor since the beginnings of the village’s transformation. 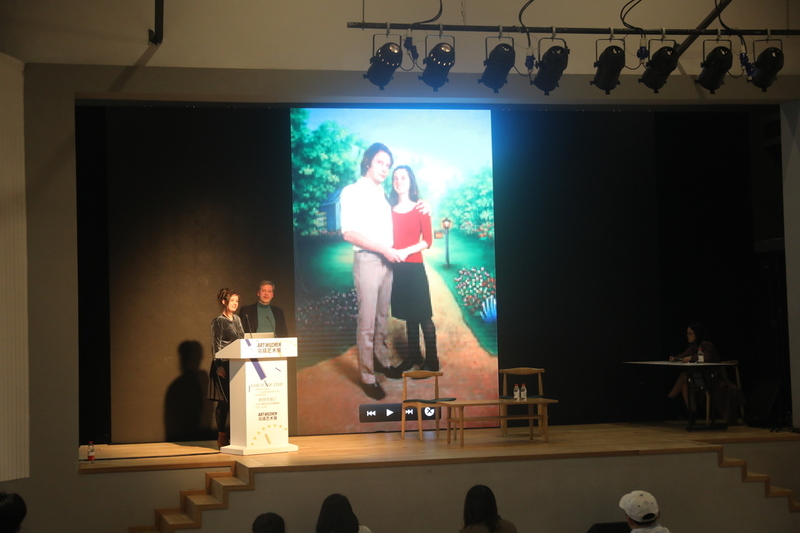 “Some of the former villagers were unhappy,” Chen Danqing said of their exodus. “But when everyone leaves, everyone gets wealthy.” Since the early aughts, the entire village has been recast as a picturesque ancient village. Now, with more annual visitors than the Palace Museum in Beijing, it’s lauded as a successful model of sustainable growth. Exhibition guests flaunting branded, assigned neckbands that allow free passage into the village through a long row of turnstiles alongside scads of sightseers. Once inside, we are chauffeured around the landscaped riverbanks of the canal town on golf carts. 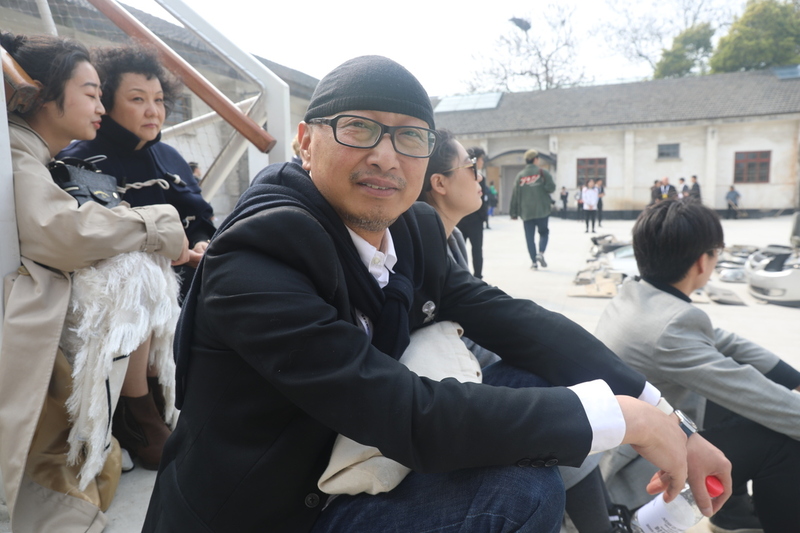 Art Wuzhen Executive Curator Feng Boyi. The next morning, March 30, was the opening ceremony. After a grandiose press conference, we became a dawdling gaggle of press, boarding carts en masse for a curatorial tour. Sporting a durag, executive curator Feng Boyi was coolly nonchalant about both the intellectual and organizational heft of the undertaking. For a high-profile exhibition under Party auspices, some edgy artworks had slipped through the cracks. “You’ve got to do something!” Feng commented. But his cocurators, Liu Gang and Wang Xiaosong, many years his junior, quickly dismissed the possibility of any potential dissidence. “You can’t tell what's real and what’s not,” artist James Beckett said of the “ancient” village. Temporal confusion was clearly an official and unofficial theme of the exhibition. With titles like “The Quaking Pendulum,” the event’s three components sprawled across and outside the scenic area, in conversation with traditional architecture and expertly installed in brand-new, state-of-the-art facilities. The artworks juxtaposed with Wuzhen’s ceramic rooftops made more sense—photogenically, that is—than ripples. 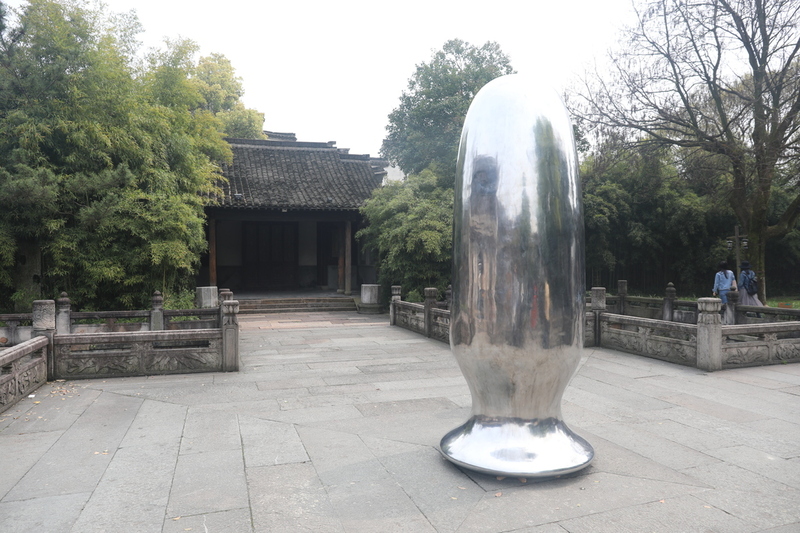 Of these publically installed works, many reflected their environment—literally, in stainless steel: Anish Kapoor’s pair of mirrored ellipses, Kazuyo Sejima’s water drop chairs, Zhao Zhao’s giant…gourd container? I strayed from the group and was soon lost amid the stone tangle holding a sleek if cartographically puzzling map. Conceptually straightforward and with unanimous appeal, the artworks, to the uninformed visitor in the West Scenic District, amounted to little more than a novel selfie op. Meanwhile, young women in layered period dress ranging from the eighth century Tang to the Republican Era roamed with costly cameras and selfie sticks, gingerly eschewing such visual intrusions. 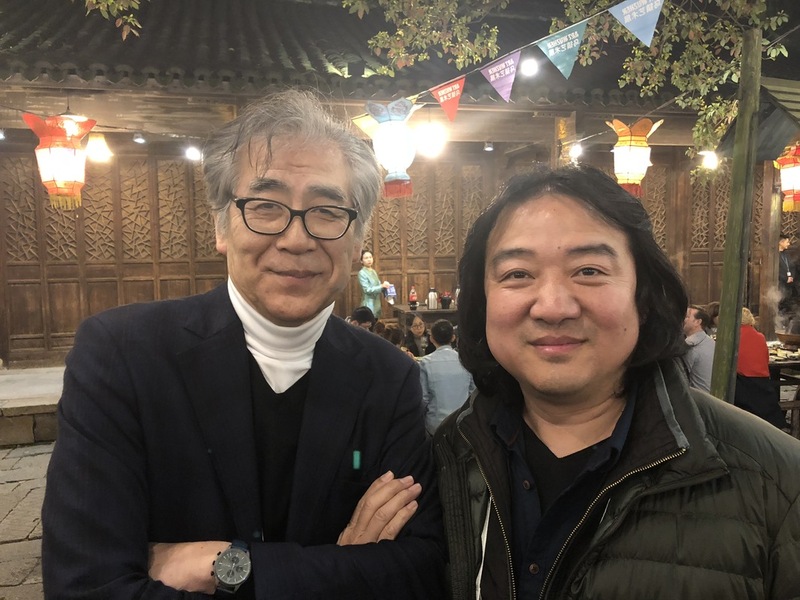 Artist Chen Danqing with Chen Hongxiang. Few artists engaged Wuzhen itself. Exceptions: Sissel Tolaas’s collection of local scents, Zhuang Hui’s inflated birdcage of timber reclaimed from local demolitions, and Katja Schenker’s concrete cast of the indigenous camphor tree. All of these site-engaging works and many more were at the Rice Barn or North Silk Factory, where art professionals making a detour from Art Basel Hong Kong were overheard commenting on the high quality of the facilities. Three years ago this land was a “dirt field,” according to artist Yin Xiuzhen, a participant in the first exhibition. The two venues combined more than 100,000 square feet of exhibition space, and with copious video works, eyeballing the entire exhibition would be a time investment most attendees at the opening could not afford. That evening we retreated to Wuzhen’s “bar street,” where dim streetlamps reflected off illuminated, moon-bridged canals. The intimacy of the cobblestoned pathways felt positively humanistic compared to the megacities most of us were visiting from. 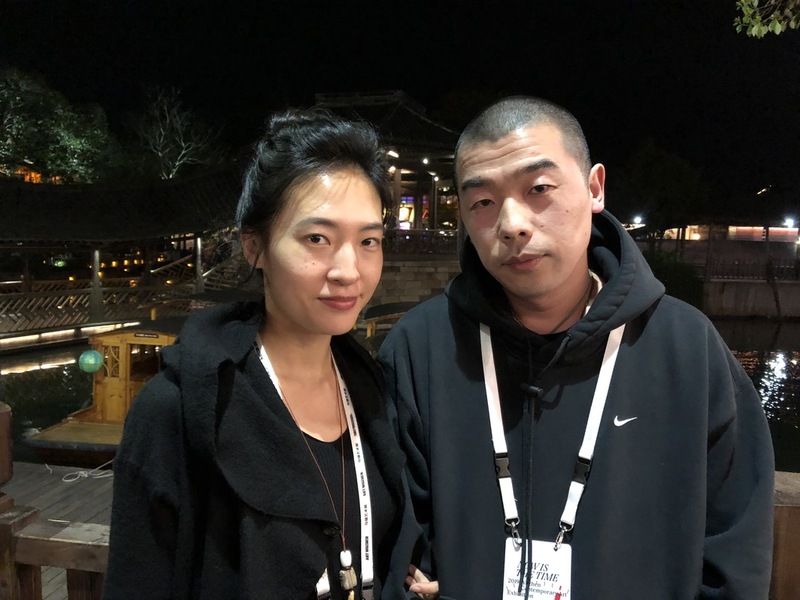 While Feng Boyi recognized the criticism of of a recent trend in China of exhibiting urban culture in rural areas (recall such failed experiments as Ou Ning’s Bishan Commune), Wuzhen isn’t exactly “rural.” Rather, Wuzhen is a historic theme park preserving a time that never existed—a redacted, sanitized, living mythology. Leaving the bar, more spatiotemporal confusion ensued: I had no idea how to return to my guesthouse (or secure a golf cart). A close-by uniformed attendant motioned for me to follow before diving into narrow winding alleys with high stonewalls. The scene recalled those of costume dramas, in which lantern-bearing servants shuttle concubines between palaces. As a city dweller, I was slightly nervous about being one of only two people in sight, and so I asked him how many village docents like himself are populating Wuzhen tonight. “About two hundred at any given time,” he responded, “with a total of over a thousand.” By that point, Wuzhen the tourist destination seemed like the most elaborate work on display, the party its author. 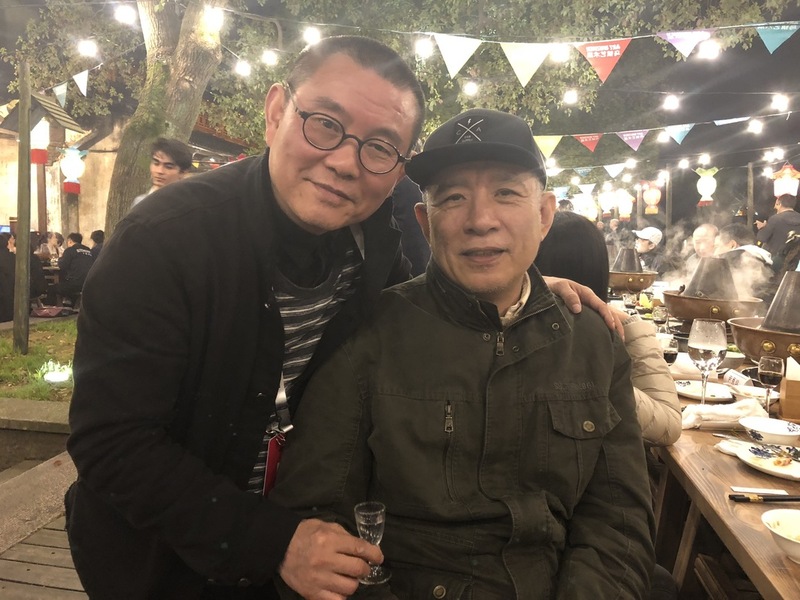 Artist Jiang Zhi with Artist Wang Tuo, winner of Youth Contemporary Art Wuzhen Award. 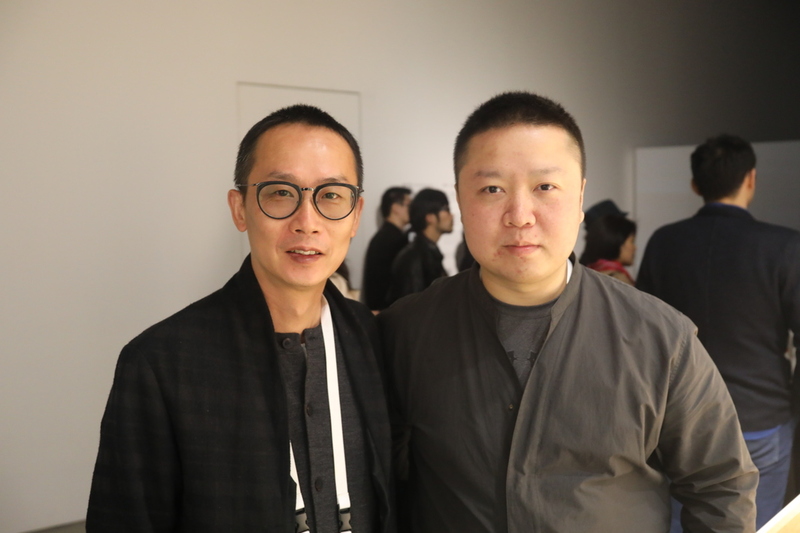 Artists Jiang Zhi and Yang Fudong. 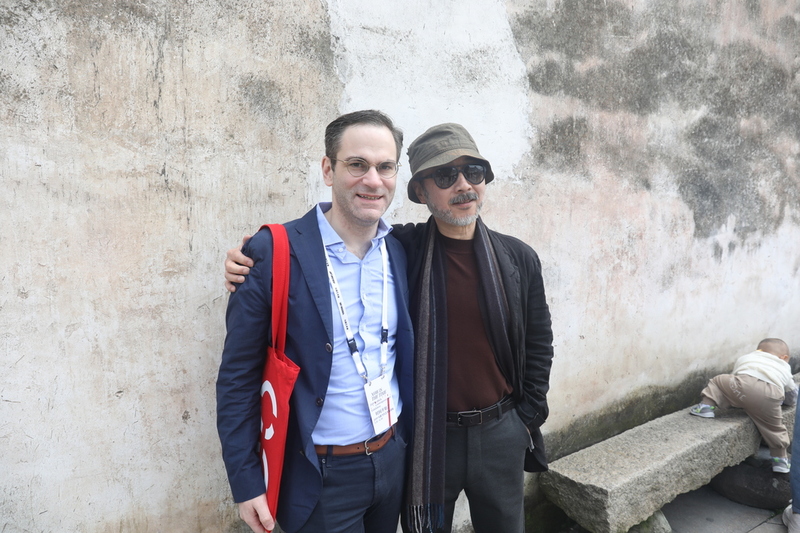 Artist Kohei Nawa with Mori Art Museum Director Fumio Nanjo. 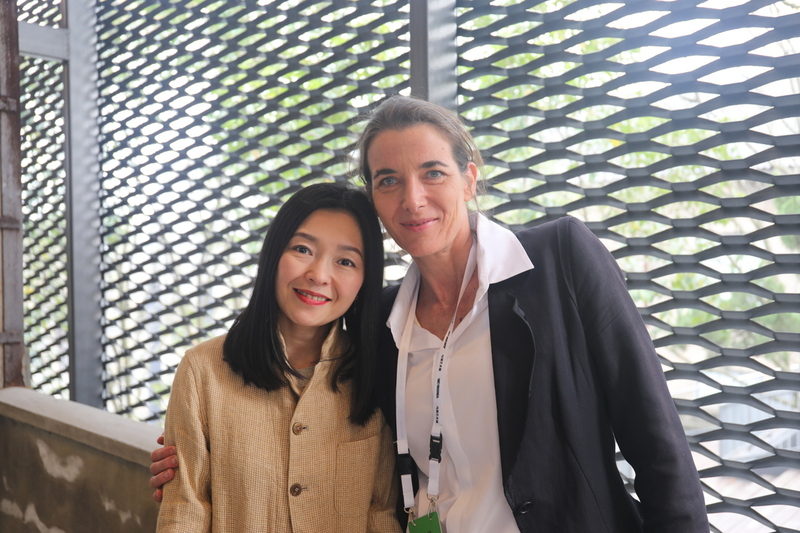 Artists Peng Wei and Katja Schenker. 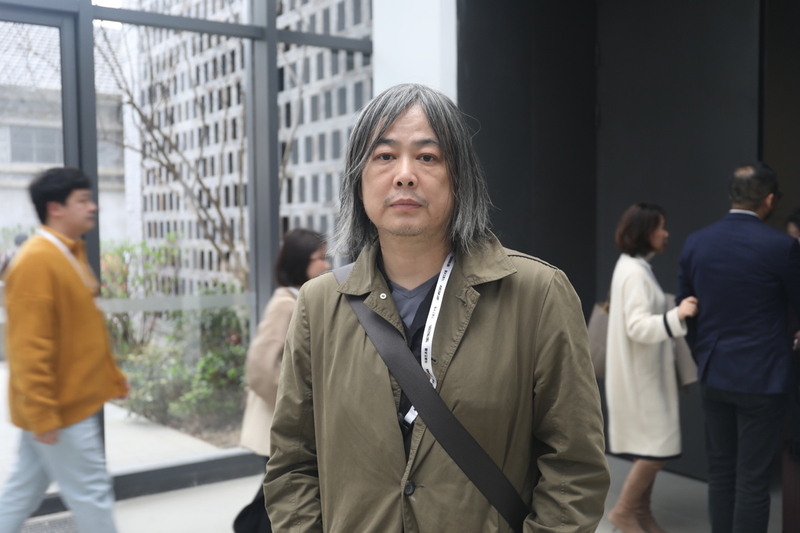 Artist Wang Tuo, winner of Youth Contemporary Art Wuzhen Award. 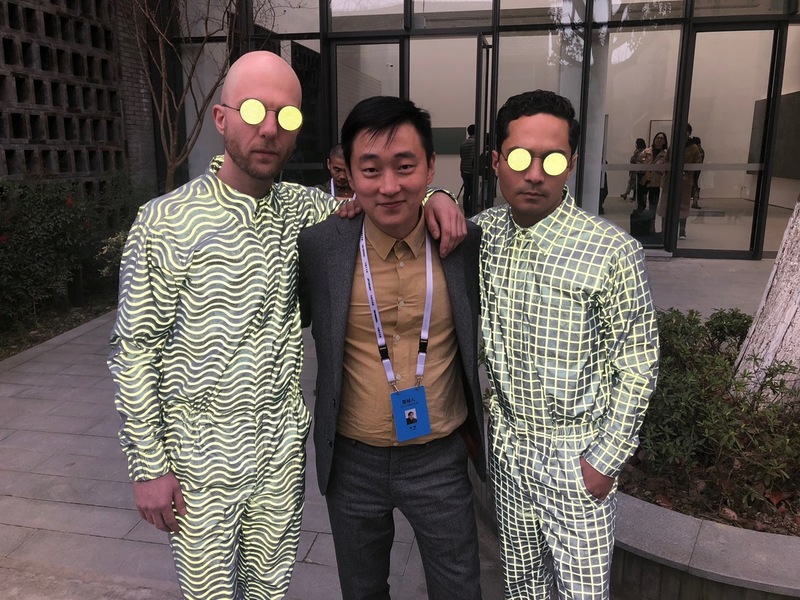 Artists Yang Bodu and Zhao Zhao. 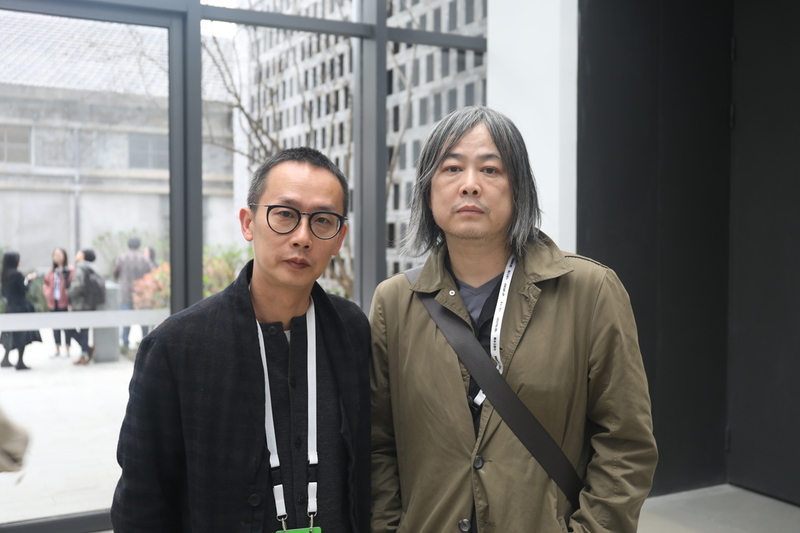 Artists Zhang Yue and Zhuang Hui. Artists Margit Lukacs and Persijn Broersen discussing their work. Children of Light with Curator Liu Gang. 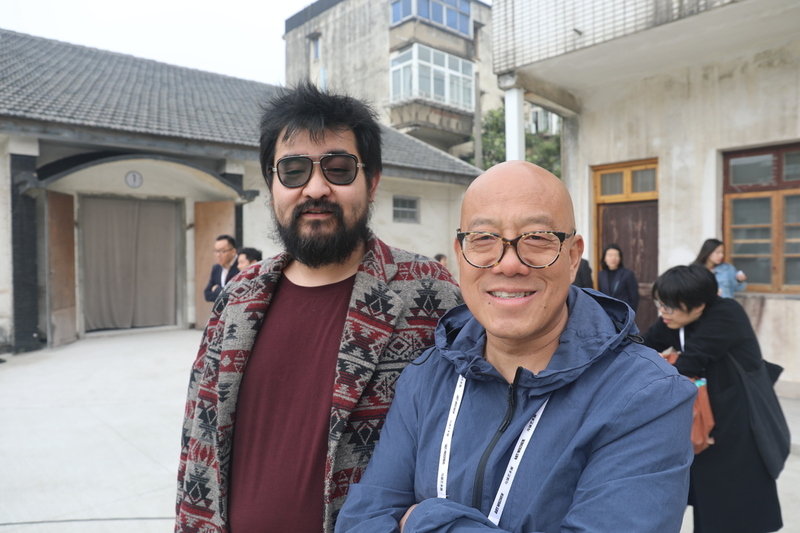 Hubei Art Museum director Fu Zhongwang and artist Xu Tan. 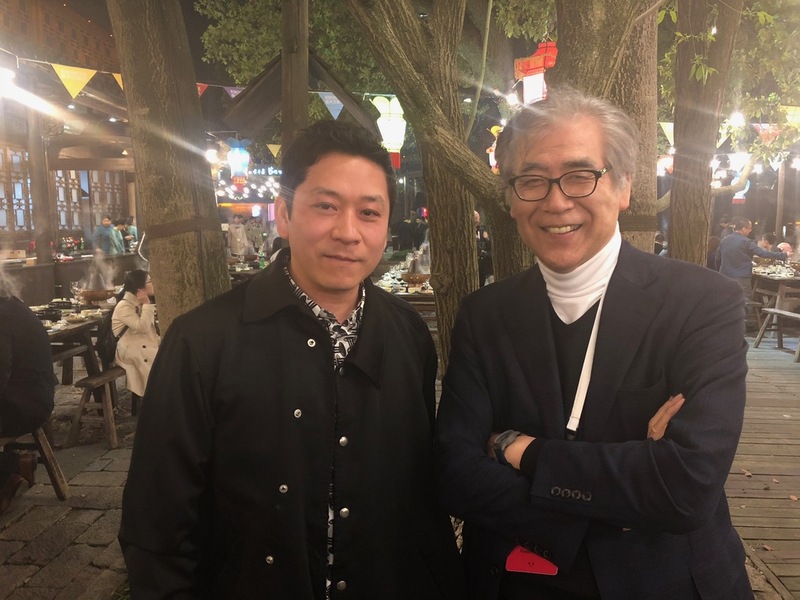 Mori Art Museum Director Fumio Nanjo and Artist Song Dong. Phil Tinari with Artist Wang Luyan. Regina Jose Galindo’s World Power performance. Shanghai Museum of Glass Director Zhang Lin with artist Yin Xiuzhen.